Starbucks is expanding its delivery service to an additional six major U.S. cities. The coffee chain announced on Monday that the service will become available to consumers in San Francisco this week. In the coming weeks, the service will launch in Boston, Chicago, New York, Washington, and Los Angeles. Starbucks said it’s aiming to offer the delivery service (which is made possible through a partnership with Uber Eats) at nearly one-fourth of its U.S. stores. Last fall, the company tested its delivery service at 200 stores in Miami and determined that the delivery option resulted in larger sales per ticket. “We’re seeing an expanded ticket. And that average ticket is what we need to see happen as we approach delivery,” Roz Brewer, Starbucks’ chief operating officer, told CNBC. “We know we have untapped customer demand for Starbucks Delivers in the U.S. and starting today, we’re expanding our best-in-class experience to our customers both in and out of our stores,” Brewer said in a statement about the expanded availability of Starbucks Delivers. 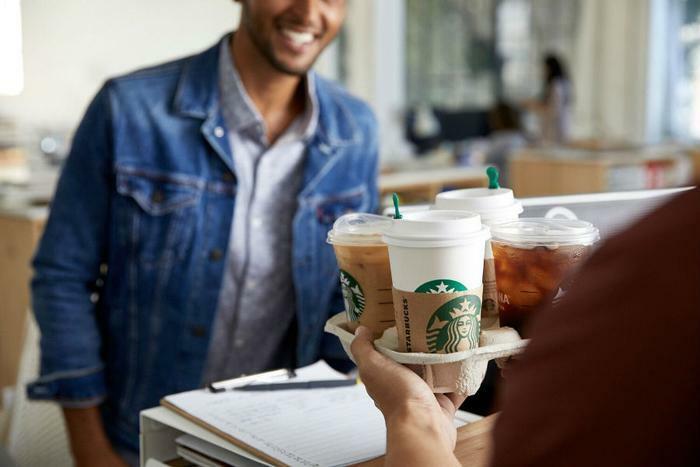 “We’re building on key learnings from past delivery pilots and by integrating our ordering technology directly with Uber Eats, we’ve unlocked the ability to bring Starbucks to customers for those times when they’re not able to come to us,” Brewer said. Customers who request the delivery option will be charged a $2.49 booking fee. Starbucks says 95 percent of its menu will be available to order via the Uber Eats app on iOS or Android.